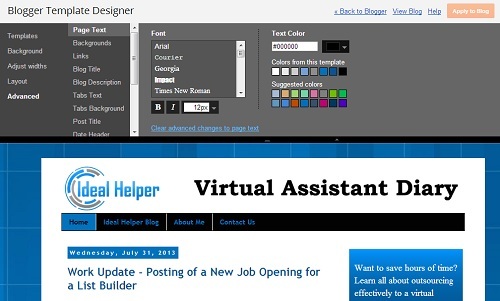 Worked on the virtual assistant diary website @ blogger and made the following changes. Implemented your said changes i.e Sub-headings and work diary screenshot. In my mobile device, some navigation texts were incomplete. For example 'outsourcing to odesk' is shown as 'outsourcing to' & 'odesk case studies' is 'odesk case' and there were many other similar incomplete text buttons, Therefore I have reduced the size of nav-bar text and now it's looking fine. Please have a review and let me know if the text is too small and hard to read out. Same a lot of whitespace in between facebook and share this page widget. Else the beta test is good, please spend some time with it and let me know when it needs to be live for all. I have implemented your said changes to ListBuilding_Tracking spreadsheet. About sending emails with viralmailprofits, I think this service is the most complicated one and I rank this the lowest because it's very time consuming. First of all, one ad only gives you 4-6 credits (whereas other give 10-15 credits/ad), second it also ask to solve a captcha type image, that is why average credits/min are too low i.e 27. The only good thing it has that we can schedule an email, but for that we'll need a lot of credits and its really difficult to create 1000 credits/week. Approved some of the newly received truth or dare stories and submitted some of them after researching one flickr picture for each.